Unfortunately GSoC has finished. It was a wonderful adventure: I got new friends, wrote some code (~8350 lines counted by "wc -l", so it includes all crap) and learnt new interesting things. I can say that after today's commit to my git repo (with a lot of changes to yesterday's commit, which is evaluted) I implemented all things I promised. But some things still require a lot of love. Alexander Dymo(adymo, KDevelop) — My mentor who is strong both in GUI and Git. Andreas Pakulat(apaku, KDevelop) — The man who can help with any part of KDevelop(or maybe even ith whole KDE && Qt). Shawn O. Pearce (spearce, Git) — A man who is not in KDE, but who contacted my mentor and me to suggest his help. Marco Costalba — QGit author, explained a lot of code from QGit. Paul Mackerras — Gitk author, explained some basic algorithm (building rev history). All guys from different IRC channels, mailinglist. And of course Google for the amazing Open Source Program: Google summer of Code! I had a lot of non-development problems, but this week I continued to develop my GSoC project (it's the last thing, that can be evaluted, but improved — yesterday's code is very buggy xD). 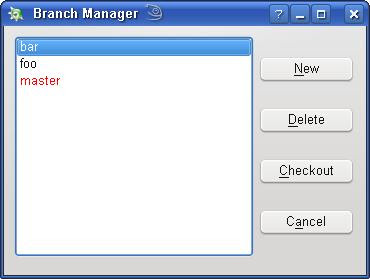 The only thing to implement is branch labels. In September I will implement another algorithm, used in QGit. Thanks a lot to Marco Costalba (QGit author) for explanation of QGit's algorithm. I also have some tips from Paul Mackerras (gitk author), and maybe I will use it too (but I'm not so strong in bash to read gitk code). Guys thanks for your help! Was offline for a week (or even more), but now I'm back and can continue development. 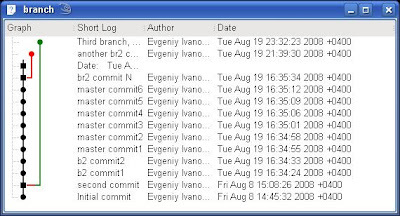 Here are screens of KDevelop DVCS branching and committing managers. They can work with any DVCS (currently I support only Git code, but will give a love to Mercurial and Bazaar). 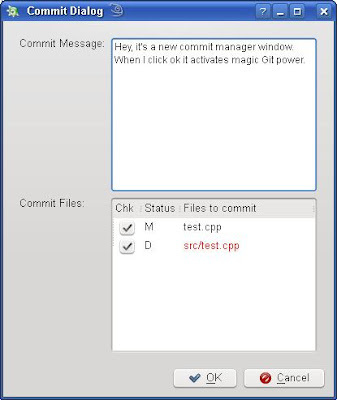 Commit manager is a big “quick and dirty”, but I will try to make it clear tomorrow.